Here are some ideas to help conversation and communication become easier and more productive. With simple ways to help kids open up, your relationships can become better, you can be alerted to situations that need special attention, and your kids can feel confident in your love. If your child is answering with one-word responses, it’s because you’re asking them closed questions. (Did you have fun at school today? Yes.) Try asking specific questions and carefully listening so you can know which questions to ask next. In order to do this, you need to be in on what makes up your child’s life. Probably the most important step toward asking good questions is to be attuned to your kids’ studies, schedules, victories, challenges, and friends. Talk to teachers. Look around classrooms. 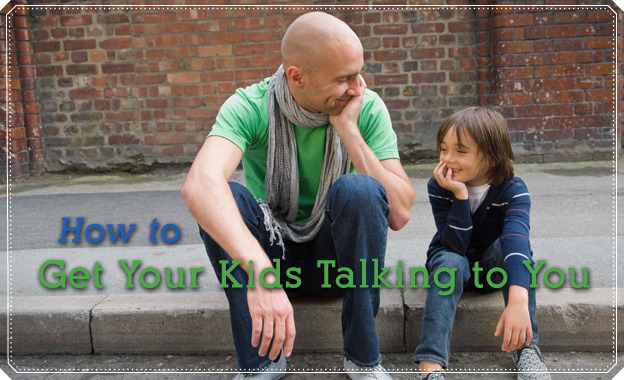 Watch and listen while your kids interact with friends. Discuss daily schedules and, most important of all, catch them doing things right and compliment them on it. Knowing what’s going on in your children’s lives makes you a better conversationalist because it allows you to ask specific questions and prepares you to truly listen to the answers. For example, you’ve talked to your daughter’s preschool teacher and you know her favorite area is the sensory table. You might then ask your daughter, “What was in the sensory table today?” You may have noticed your high school son didn’t talk to his best friend Jim over the weekend. Jim usually calls fifteen times. You might ask him, “What’s new with Jim?” By staying attuned to kids’ lives, you’ll never be at a loss for good questions. The truth is, even when you ask specific questions, your preschooler may still not remember much about her day, and your teen may still offer only one—or two—word answers. If so, this is a good time to pull out humor, another effective device for starting a conversation. Getting a giggle from young children is easy because they love to correct you. For instance, if your child is studying farm animals ad preschool, you might ask if she learned that cows say “neigh” and then follow that with both ridiculous and specific questions. One way to make older children smile is to feign dramatic reactions to their short answers. For example, you might clutch your chest and say, “Oh, I’ve been away from my dearly loved children for over eight hours and now … they tell me so little about their day!” It may sound cheesy, but try out a few different humor ideas to see what makes your kids smile. For many kids, it works best to warm them up with specific questions or humor before asking one or more of these relatively advanced everyday questions. We parents need to patiently wait for answers from kids. It can take a while for them to formulate answers, so it’s important to remember not only to ask good questions but also to patiently and silently wait for answers. Patient listening helps foster kids’ communication skills and their future willingness to share what’s on their minds. Before your kids get home from school today, hang up the telephone and turn off the radio, television, and computer, and take a few minutes to formulate how you’ll greet them. What will you ask? How carefully will you listen? Then when your kids barge through the door remember this: Closeness-building conversation is primarily a function of good questions and careful listening—simple things that can yield a lifetime of invaluable rewards for you and your children.